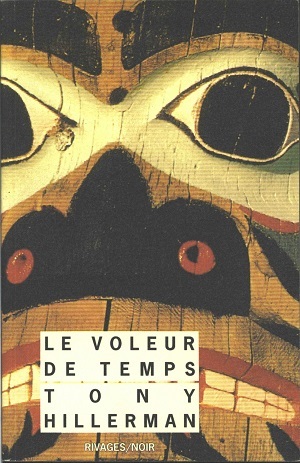 This is the second French paperback edition of A Thief of Time. This edition was published in 1992 by Rivages/Noir in Paris, France. Tony Hillerman's original English text was translated into French by Danièle and Pierre Bondil. This is a reissue of A Thief of Time and is significantly smaller than the 1989 Rivages Thriller edition. The photograph on the cover is by D.R. and depicts a Kwakiutl totem pole carving. Format: Paperback, 16.9 x 11 cm.